NEWTON, MASSACHUSETTS (USA) - Caliper is excited to announce a new Ireland Country Package! The product includes a wealth of data and functionality not available in any other software. 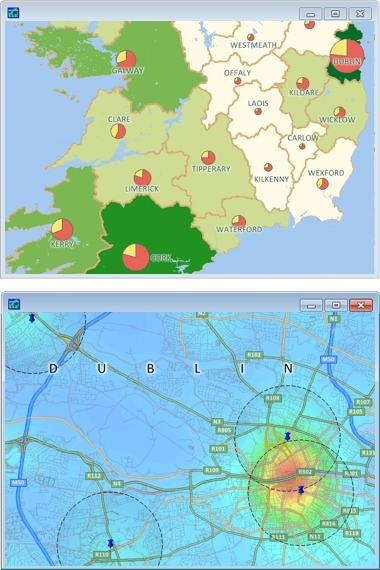 The Ireland data includes an up-to-date street layer with travel time information for computing routes. Also included are administrative boundaries, railroads, building footprints for many urban locations, and comprehensive named landmarks that range from public facilities to commercial buildings including shops, restaurants, and retail stores. Maptitude ships with one country of your choice (currently the U.S.A., Argentina, Australia, Brazil, Canada, Chile, Colombia, Ecuador, France, Germany, India, Ireland, Italy, Mexico, Netherlands, New Zealand, Portugal, South Africa, Spain, and United Kingdom), and additional packages can be purchased separately for US$595 as they become available. You can now switch between the countries you have purchased. Doing so refreshes the Maptitude interface with country-specific tools such as those for finding, pin mapping (geocoding), routing, and creating maps.